The Mealy Mountains in Southern Labrador has been threatened by forestry and construction which would destroy the natural beauty of a waterfall or two, wildlife and greenery. 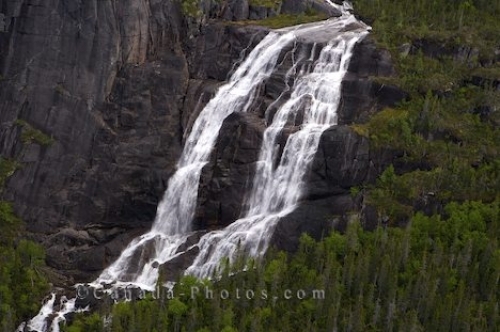 On the way to some fabulous accommodations in the wilderness on the banks of the Eagle River in Southern Labrador you will find a beautiful waterfall such as this rushing down the slopes of the Mealy Mountains. There are many scenic spots throughout these mountain ranges that are home to some of best wetlands, salmon habitats, waterfalls, rivers and a variety of different species of wildlife. Picture of a waterfall cascading down the rock cliffs in the mountain range known as the Mealy Mountains in Southern Labrador.